This lorry was made by the Vulcan company in 1922. The driver’s cabin is made primarily from wood, as is the flat bed at the rear. Its livery is dark brown with decorative yellowish-cream piping. 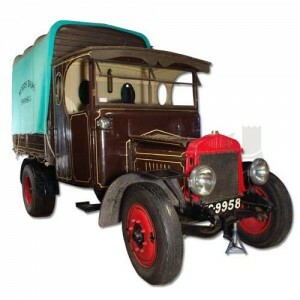 The tarpaulin which encloses the rear of the lorry is a mint green, and has the wording Morris Bros. Swansea, printed across it.